The African youth wants to take advantage to the ongoing sustainable development opportunities in the continent. Introduction. 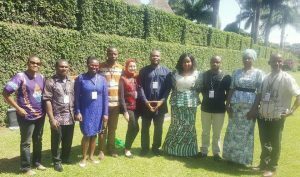 Recently, the African youth elected the Interim Executive Board members of the Comprehensive Africa Agriculture Development Programme CAADP) Youth Network in Uganda. The Comprehensive Africa Agriculture Development Programme is an African Union’s policy framework for agricultural transformation, food security and nutrition, economic growth launched in 2003. The Comprehensive Africa Agriculture Development Programme youth network is a youth ( 18 to 35) platform for farmers, Agroentrepreneurs, Nutritionists, and Agricultural practitioners. Their Goal: Create one million jobs for youth in the Agriculture Value Chain by 2025 and supported Agroentrepreneurs by 2020. Their Focus Areas: Agribusiness, Food Security and Nutrition, Climate Smart Agriculture, Green and Blue Economy. The official launched of this youth network is expected to be held in Dakar ( Sénégal) in September 2017. In October 2016, two African organizations, the African Youth Initiative on Climate Change (AYICC) and the Comprehensive Africa Agriculture Development Programme CAADP Youth Network supported the publication of a book which aims to establish and promote at least 10,000 youth-led farms and agribusinesses across Africa by 2020. This publication named as “Youth Eco-Smart Projects” was developed by Fresh & Young Brains Development Initiative. Fresh & Young Brains Development Initiative is a Nigerian youth Non Governmental Organization and the founder is a young Nigerian lawyer, Nkiruka Nnaemego. She is also an agroentrepreneur and development practitioner. Nkiruka and her colleagues from Africa (Ibraheem Ceesay from the Gambia, Mariam Allam from Egypt…) are engaging and integrating African youth in the implementation of the Nationally Determined Contributions (NDCs) and Comprehensive Africa Agriculture Development Programme (CAADP) processes. The book has been launched during the United Nations Framework Convention on Climate Change (UNFCCC) Conference of Parties (COP22) in Morocco November 10, 2016, at the Youth Side Event on “ Integrating Youth in the Implementation of the Nationally Determined Contributions (NDCs) across Africa. This event was indeed organized by the African Youth Initiative on Climate Change ( AYICC), an African Union initiative launched in 2006 with the aim of mobilizing young people to have one voice on the issues of climate change. The book intends to promote selected youth-led ecologically smart projects and initiatives. It encourages African Governments and Partners to support the selected projects. It finally advocates for more financial support to ensure active youth engagement in sustainable agriculture. A Youth Farm Project launched on April 2014 in Nigeria with the leitmotiv “ my farm, my swag”. The project adopts a comprehensive and integrated approach that directly engages youth and different stakeholders in Agriculture to promote multi-sectoral and inter-generational partnerships necessary to promote agriculture and food security. www.yfarmproject.com. The project targets and focuses on rural youth leadership, employment and entrepreneurial development especially as regards environmental and climate smart agriculture across Africa. The project identifies measures and best practices for incentivizing the agricultural sector for more youth engagement. Climate Smart Agriculture and Agricultural Value Chain were organized for youth and women from six Nigerian States – Imo, Abia, Cross River, Anambra, Enugu and Ebonyi with support from Caritas Nigeria and JDPC from November 2015 – January 2016. Poultry starterpacks were given to over 450 youth trained during the Bootcamps to start their small scale farms. The trained youth have either upscaled their farms or run joint enterprises as a result of the training. Goal: To promote a youth-led agribusiness society, reduce poverty and increase active youth participation in sustainable agriculture by 2020. Target: To establish, celebrate and promote at least 10,000 youth-led farms and agribusinesses across Africa by 2020.